Yikes - A Harley for .99 - incredible. 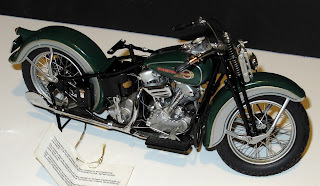 It's an eBay auction for a 1936 Harley -- however, it's a 1/10 scale model by Franklin Mint. Check it out--it could be a very inexpensive way to put you on a Harley. Once and a while we do auctions for other than books/book related items. This qualifies.